The Big Falcon Rocket system underwent a growth spurt since it was unveiled in 2017. SpaceX's Mars-colonizing Big Falcon Rocket (BFR) spaceflight system just went through a growth spurt. The reusable rocket-spaceship duo will stand 387 feet (118 meters) tall at launch, SpaceX founder and CEO Elon Musk said Monday (Sept. 17) during a webcast event at the company's headquarters in Hawthorne, California. That's 11 percent taller than the previous design iteration, which the billionaire entrepreneur laid out in September 2017. Those two rear "actuated" fins will also serve as landing pads, as will a leg back there that's styled to look like a fin for symmetry and aesthetic purposes, Musk said. The 2017 version of the BFR spaceship didn't have any front fins, and it sported just two rear "delta wings," which weren't part of the landing-leg system. "I think this design is probably on par with the other one," Musk said during Monday night's event. "It might be better. It's slightly riskier technically, because of coupling legs and sort of the actuating wing-fin flaps. But I think it's the right decision overall. I think it looks beautiful." He also cited the new design's resemblance to the rocket used by the comic-book character Tintin in the 1954 adventure "Explorers on the Moon." "I love the Tintin rocket design, so I kind of wanted to bias it towards that," Musk said. "If in doubt, go with Tintin." Despite its recent growth, the BFR is still smaller than it was at birth, when it was known as the Interplanetary Transport System (ITS). Musk unveiled the ITS architecture at a conference in Mexico in September 2016, announcing that the vehicle would stand 400 feet tall (122 m) and be 40 feet (12 m) wide. That girth was scaled down to 30 feet (9 m) in the 2017 update and remains the same today. Indeed, there shouldn't be many big changes to the booster or spaceship going forward, Musk said Monday night. "I feel like this is the final iteration in terms of broad architectural decisions for BFR, BFS [Big Falcon Spaceship]," he said (though he did later add that the next version of the spaceship will probably also feature some vacuum Raptors). The architecture update was a bit of a sidelight Monday night. The main point of the event was to introduce Japanese billionaire Yusaku Maezawa as the person who bought a round-the-moon flight aboard the BFR that could launch as soon as 2023, if development and testing of the vehicle go smoothly. Maezawa said he plans to take six to eight artists with him on the mission, which he is calling #dearMoon. He expects the works they create after returning to Earth to be transformative. "These masterpieces will inspire the dreamer within all of us," Maezawa said. Musk praised Maezawa's bravery and said his purchase (the cost of which was not disclosed) will help the development of the BFR significantly. 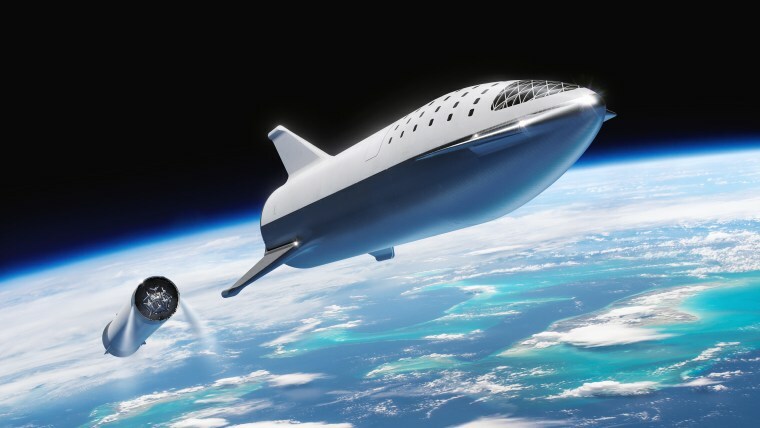 SpaceX envisions the BFR eventually ferrying people to the moon, Mars and other worlds on a regular basis, helping humanity extend its footprint into the solar system. "The BFR is really intended as an interplanetary transport system that's capable of getting from Earth to anywhere in the solar system, as you establish propellant depots along the way," Musk said. Will Elon Musk Fly on SpaceX's Private Moon Flight in 2023 with Japanese Billionaire?